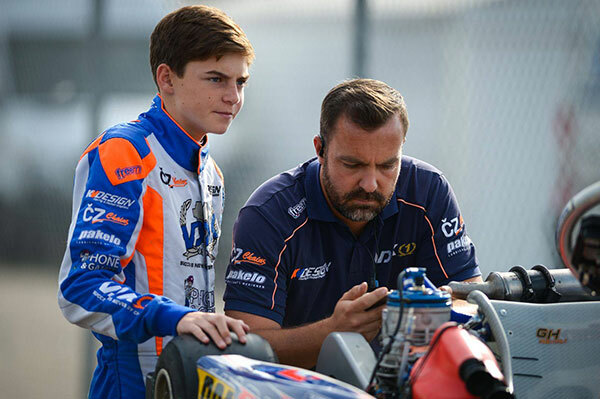 The Frenchman Victor Bernier is a 14-year-old Driver who made his debut in the OK-Junior category just over a year ago, coming straight into the top 10 of the 2017 World Championship. He had good performances this year, especially in the FIA Karting European Championship – Junior and just missed the final podium. A calm and quiet boy out of his kart, Victor continues the same balanced behaviour during the races. His simplicity and maturity make him an endearing character. HOW DID YOU START IN KARTING? My father was a kart Driver, although especially in cars on circuits. He is passionate and he wanted to take my younger brother Augustin and I Karting for fun. From there, the passion came gradually. I was well trained for two years within the Kart Racing Academy, a turnkey one-make formula organised by Sodikart. I had a good foundation for competing in FFSA events. My mother is a great sportswoman, she soon taught me good habits so I could be in good physical condition. HOW DID THE WORLD CHAMPIONSHIP GO IN SWEDEN? We worked a lot with the team to prepare the Qualifying Practice in the dry despite a threat of rain. Then we had to deal with changing conditions with several showers. It was complicated to manage tyre settings and pressure until the last moment before returning to the dummy grid. Saturday was the worst day. Still, I felt relatively comfortable with my kart when the track was wet, and it was frankly excellent in the dry. On the whole, the heats went well, except for a front fairing penalty, because of a mistake that I should have avoided. I was starting 5th for the Final, but I knew that the performance would come gradually so I did not rush to attack. When the time came, I started to overtake. I tried a first attack on Taylor Barnard, but he came back immediately. I managed to take the lead on the next lap, the seventh, and I led until the 21st under the chequered flag, watching out for a possible return from my opponents. YOU SEEM TO KEEP YOUR CALM IN ALL CIRCUMSTANCES. IS THIS REALLY TRUE? Absolutely, it’s not a facade, I’m not very sensitive to stress. I know what I have to do and I try to do it as best I can, that’s all. For the World Championship, I probably had a little more pressure, but that did not upset me. I’m staying with my team, VDK Racing, for a full season in OK. Then it will be time to think about cars. I think OK will enable me to learn much more that will be very useful for me in the future, and to grow in maturity.